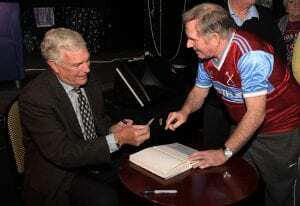 At the end of November, Hammers legend Sir Trevor Brooking spent the afternoon with 60 older West Ham Fans at the East Ham Working Men’s Club for a special event as part of the Football Friends programme run by Friends of the Elderly and West Ham Foundation. 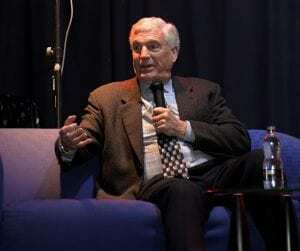 Sir Trevor took the time to answer questions from the audience then proceeded to meet each and every person in attendance to sign merchandise – which included match day programmes from his years of playing, football shirts, books and footballs. 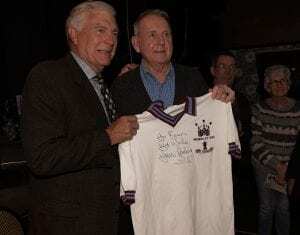 Guests at the event had the opportunity to sign up for a five-week Football Friends programme called Any Old Irons. Run in partnership with the West Ham United Foundation and the Premier League (PL) with the support of the Professional Footballers’ Association (PFA), the Any Old Irons initiative gives participants the opportunity to connect with other fans and locals in their community, bringing them together for fun and friendship. During the programme, there will be the opportunity to share stories about the club, hear guest speakers, enjoy a stadium tour and learn digital skills to help stay connected online. The project has been hugely successful amongst older West Ham fans who would otherwise experience loneliness and isolation. There are still spaces on the next Football Friends programme, which starts on 17 January 2018. For more information about Football Friends, please contact Friends of the Elderly on 0330 332 1110 or hello@fote.org.uk.